Stress relief tip: Breathing exercises at least once a day for about 20 minutes. Sit comfortably in a chair with feet flat on the floor. Close our eyes and focus on your breathing. Inhale slowly, deeply through your nose and fill your lungs. Hold it for a few seconds. Then exhale slowly via your mouth. Repeat a few times. 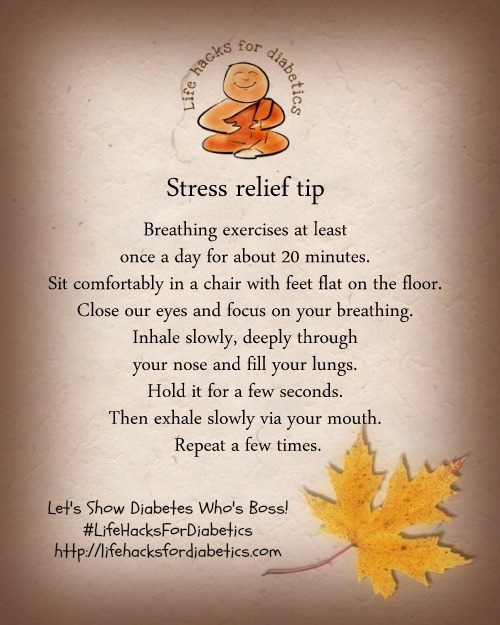 More about reducing stress to manage diabetes here. Stretching and breathing are one of the things that I do to relieve stress. Actually, I haven’t noticed this habit when I am stressed until my officemate break a joke that I was definitely stressed because I started breathing deeply and stretching. Since then, I started taking Ashwagandha, an India herb, to combat stress because of it has stress-relieving properties. There are natural ways to manage stress though, eating a balanced diet, meditation and regular exercise.